The choice is yours . . . The Academic, Niall Horan, Soulé and Wyvern Lingo are among the nominees for this year's RTÉ Choice Music Prize, Irish Song of the Year 2017 with the winner decided by the public. The prize will be launched tonight at Tramline, Dublin with a live broadcast on 2FM from 8.00pm to 10.00pm featuring exclusive performances from some of the Song of the Year nominees. To vote for the RTÉ Choice Music Prize, Irish Song of the Year 2017, visit www.2fm.ie. Votes are limited to one per person per day. Only votes cast in the Republic of Ireland will be counted. Voting closes at midnight on Sunday, March 4. Previous winners of the Choice Song of the Year have included Royseven with We Should Be Lovers, The Original Rudeboys with Never Gonna Walk Away, and last year’s winner, Picture This with Take My Hand. 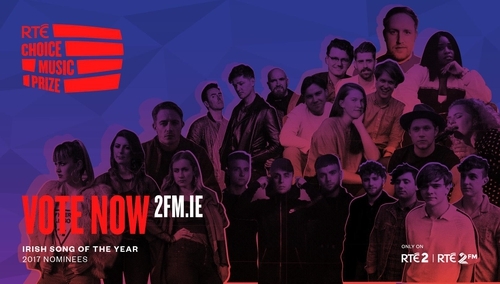 Once again, RTÉ 2FM is celebrating the announcement of the shortlist across its schedule on Wednesday with All Irish Music All Day from 6.00am to midnight.